Kuan Yin (觀音; Guan Yin; Kwan Yin etc.) is the bodhisattva of compassion as venerated by East Asian Buddhists as the Bodhisattva Avalokitesvara. Commonly known in the West as the Goddess of Mercy, Kuan Yin is also revered by Chinese Taoists as an Immortal. The name Kuan Yin is short for Kuan Shih Yin (py: Guan Shi Yin) which means «Observing the Sounds of the World». In Japanese, Kuan Yin is called Kannon or more formally Kanzeon ; the spelling Kwannon, based on a pre-modern pronunciation, is sometimes seen. In Korean, this incarnation of Buddha is called Gwan-eum or Gwanse-eum, and in Vietnamese, the name is Quan Âm or Quan Thế Âm Bồ Tát. Kuan Yin is the Chinese name for the Bodhisattva Avalokitesvara. However, folk traditions in China and other East Asian countries have added many distinctive characteristics and legends. Avalokitesvara was originally depicted as Buddha when he was still a prince, and therefore wears chest-revealing clothing and may even sport a moustache. However, in China, Kuan Yin is usually depicted as a woman. In China, Kuan Yin is usually shown in a white flowing robe, and usually wearing necklaces of Indian/Chinese royalty. In the right hand is a water jar containing pure water, and in the left, a willow branch. The crown usually depicts the image of Amitabha Buddha, Kuan Yin’s spiritual teacher before she became a Bodhisattva. She is flanked by her two acolytes, who appeared to her when meditating at Mount Putuo, Long Nü and Shan Tsai. 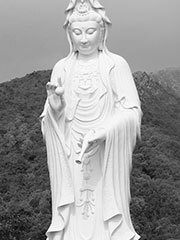 Along with Buddhism, Kuan Yin’s veneration was introduced into China as early as the 1st century CE, and reached Japan by way of Korea soon after Buddhism was first introduced into the country from the mid-7th century. One Buddhist legend presents Avalokitesvara as vowing to never rest until he had freed all sentient beings from samsara. Despite strenuous effort, he realized that still many unhappy beings were yet to be saved. After struggling to comprehend the needs of so many, his head split into eleven pieces. Amitabha Buddha, seeing his plight, gave him eleven heads with which to hear the cries of the suffering. Upon hearing these cries and comprehending them, Avalokitesvara attempted to reach out to all those who needed aid, but found that his two arms shattered into pieces. Once more, Amitabha came to his aid and appointed him a thousand arms with which to aid the many. Many Himalayan versions of the tale include eight arms with which Avalokitesvara skilfully upholds the Dharma, each possessing its own particular implement, while more Chinese-specific ones give varying accounts of this number. In China, it is said that fishermen used to pray to her to ensure safe voyages. The titles ‘Kuan Yin of the Southern Ocean’ and ‘Kuan Yin (of/on) the Island’ stem from this tradition. Another story, possibly Taoist in origin, describes Kuan Yin as the daughter of a cruel father who wanted her to marry a wealthy but uncaring man. She is known as Miao Shan (妙善), and her father’s realm allegedly Sumatra. She begged to be able to enter a temple and become a nun instead. Her father allowed her to work in the temple, but asked the monks to give her very hard chores in order to discourage her. The monks forced Kuan Yin to work all day and all night, while others slept, in order to finish her work. However, she was such a good person that the animals living around the temple began to help her with her chores. Her father, seeing this, became so frustrated that he attempted to burn down the temple. Kuan Yin put out the fire with her bare hands and suffered no burns. Now struck with fear, her father ordered her to be put to death. After she died she was made into a goddess for all of her kindness and began her journey to heaven. She was about to cross over into heaven when she heard a cry of suffering back on earth. She asked to be sent back and vowed to stay until all suffering had ended. One version of this legend states that, at the point of Kuan Yin’s father’s execution of her, a supernatural tiger took Kuan Yin to one of the more hell-like realms of the dead. However, instead of being punished by demons like the other inmates, Kuan Yin played music and flowers blossomed around her. This managed to completely surprise the head demon. The story says that Kuan Yin, by being in that hell, turned it into a paradise. Another version of the same legend goes that upon entering hell Kuan Yin was overwhelmed with grief at the suffering souls must endure in hell. Out of compassion, she freed many of the souls from hell before being stopped by the Yen Lou Wang. She then returned back alive on Earth and resided at Po-tu Island. Another tale goes that Miao Shan never died but was in fact transported by a supernatural tiger, believed to be the Diety of the Place to Fragrant Mountain. The Legend of Miao Shan usually ends with Miao Chuang Yen, the father of Miao Shan falling ill with jaundice. It is said that no physician could cure him. Then a monk appeared saying that the jaundice can be cured by making a medicine out of the arm and eye of one without anger. The monk further suggested that such a person could be found on Fragrant Mountain. Miao Shan when requested offered up her eyes and arms willingly. Miao Chuang Yen was cured of the illness and went to the Fragrant Mountain to give thanks to the person. When he discovered that his own daughter gave up her arm and eyes for him, he begged for forgiveness. The story concludes with Miao Shan being transformed into the Thousand Armed Kuan Yin and the king, queen and her two sisters building a temple on the mountain for her. Many observers have commented on the similarity between Kuan Yin and the Blessed Virgin Mary of Christianity. The Tzu-Chi Foundation commissioned a potrait of Kuan Yin and a baby that resembles the typical Madonna and Child painting. Some Chinese of the overwhelmingly Roman Catholic Philippines, in an act of syncretism, have identified Kuan Yin with the Virgin Mary. During the Tokugawa shogunate period in Japan, when Christianity was banned and punishable by death, some underground Christian groups venerated the Virgin Mary disguised as a statue of Kannon; such statues are known as Maria Kannon. Many had a cross hidden in an inconspicuous location. Canon, the name of the Japanese company known for cameras and imaging products, is loosely based on the Goddess of Mercy’s name. Additionally, the first camera released by Canon was named Kwanon .